Alexandre Rado was a world renown Ellington scholar and his research provided pivotal information about some of the Duke’s early and most important recordings. In 1975, Rado played a role in bringing drummer Sam Woodyard to Europe. Alexandre Rado knew and worked with Phil and Phil’s father Walter Schaap. This is a letter written on Duke Ellington’s 94th birthday to Walter that cites many things but applies mostly to the International Duke Ellington Conference held in NYC in 1993. In 1937, Phil’s late father, already an accomplished scholar, went to Europe while still a teenager. In Paris and a Jazz lover, Walter Schaap visited the offices of the French magazine Jazz Hot. It was at the moment that Jazz Hot decided to publish its articles simultaneously in French and English. Schaap, père, became the translator and Jazz Hot would stay in contact with Walter – who by the 21st Century was just about the only person still alive from the early days of Jazz Hot. 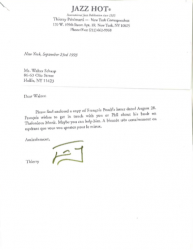 In 1993, Thierry Pérémarti corresponded with Walter (and Phil) on behalf of François Postif, then working on his Thelonious Monk book. Postif is best known for his legendary interview of The President (that would be LESTER YOUNG) and had previously contacted Phil and Walter about Prez. This is the 1993 correspondence. You get BOTH letters for one price! !